Our association pushed forward a new plan to attract visitors, using a subsidy from Ministry of Health, Labour and Welfare. 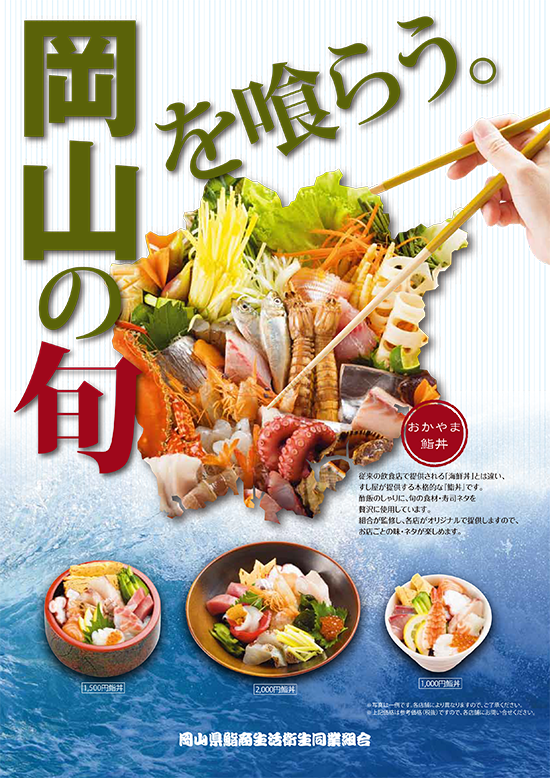 titled it [Eat season of Okayama] 【岡山の旬を喰らう】which I advocated as a part of the business plan of 2014. Speaking of Okayama, an image of elaborate “okayama bara sushi” getting used to for approximately 400 years is strong, and the thing such as “the sushi bowl”that there is sashimi on top of the bowl is never accepted to the consumers and invites today. In the past few years, whenever there was an opportunity, I performed tasting party and demonstration spot sale party about the sushi. Providing a sushi bowl for these past approximately three years(in a year 2-3 times) won a favorable reception very much until now. Unlike sea foods bowl offered in a usual restaurant , it is “the full-scale best sushi bowl”which only sushi bars can provide to. We use the seasonal ingredients and sushi material handled in Okayama every season luxuriously. Under an association supervises, each shop provides an original, so customers can enjoy taste and the sushi material in every each shop. By means of this, we want many visitors come to the stores and to feel like “the next wants to eat sushi” and become a repeater of each shop is our first purpose.